That describes this post and my emotional state over the past couple of days. Geez....talk about ups and downs. For now, however, I'm done with the downs and I will only be participating in the ups for the near future. So E is in his first play. He is playing one of the Bailey Children in a production of It's a Wonderful Life. There are 6 performances, 3 of which were this past weekend. He was very excited to be in the show and is looking forward to more opportunities like it in the future. The heavy rehearsal schedule last week and the 3 performances made for one EXHAUSTED boy, one EXHAUSTED boy who has difficulty dealing with EXHAUSTION. We're still trying to catch up with the sleep. More information about the play can be found here. The performances take place in the basement of St. Ann's Church, a church that is no longer an active parish. 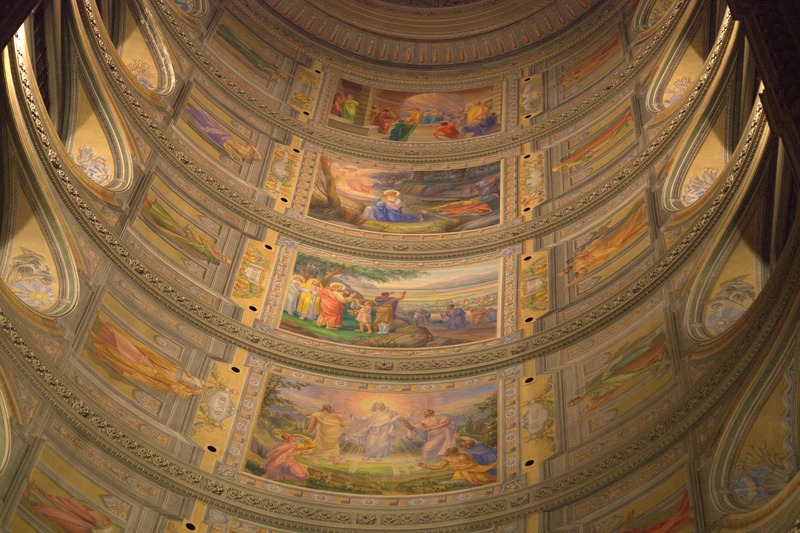 It is, however, still open to the public for tours of its amazing fresco artwork. The pictures do not begin to show the real beauty of the church. If you're local, you should go and see for yourself...it's amazing! The faces of the people seen in the murals are of actual people who belonged to the church at the time the paintings were commissioned. And, here is the artist that created all the amazing artwork...apparently he was a hunchback...even more amazing! So, one more thing...do any of you watch Parenthood? Generally it's Victor and I's 10:00 date on Tuesday evenings. Tonight, though, I'm boycotting! A few months ago they started a breast cancer story line. I wasn't sure if I was "excited" about this new story line as I have my own story to follow in that regard. However, we continued to watch and really, they seemed to be doing a decent job with portraying a somewhat accurate depiction of what the situation could be like. The previews they showed after last weeks show made me change my mind. The mom with breast cancer will be fighting death in this week's episode as she develops a fever during chemo treatment and records video goodbye messages to her kids. WHAT? Thankfully, I finished chemo 3 months ago because I didn't need this reminder that something like that could happen, nor do all the other people going through chemo. I am admittedly disappointed that Parenthood chose to add more drama to an already dramatic story line. It is my opinion that more people would have been able to relate to the story had they not added that piece, as it is more typical that people have chemo and get through it without major complications. I know for me more serious issues and side effects were always at the back of my mind, but that's where I tried my best to keep them. I know, it's just a TV show...and this is just me, venting. "You see, you've really had a wonderful life. Don't you see what a mistake it would be to just throw it away? "